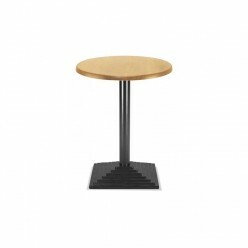 The Adam range is a selection of cafe and small dining tables with a choice of colours for the table top and a selection of aluminium or black coloured bases. This table has a black coloured, metal powder coated single column with a cast iron square foot. The table top is made in a selection of sizes (3 round and 1 square).